Kim Sun Kyung is a retired police officer and father of three sons, Gun Kang, Hyun Chal and Yi Sang. His eldest son Gun Kang made many wrong decisions in life, ending up being divorced and going bankrupt. Gun Kang gets remarried to Chung Nan. His second son Hyun Chal is the envy of the town and pride of his father. He runs a number of businesses which are quite successful. His wife Woo Mi often sacrificed her happiness for the benefit of the Kim family. As for the last son Yi Sang, he follows in his father's footsteps by becoming a police officer. Oftentimes the father and the son clash each other. As Yi Sang married Eo Young, the daughter of his father's deadly foe, an ex-convict Sun Kyung traced and eventually arrested a long time ago. 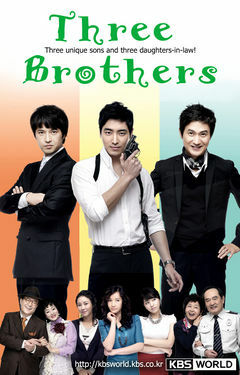 "Three brothers" revolves around their relations full of conflicts and love. Jung Ha Yoon is a graduate student who successfully passed the bar exam. However, she is not finished as she wants to be a medical malpractice litigation specialist. She works at a hospital to look to gain experience and there she meets other doctors who work there. Julian has lived off with the money he lures from his rich female customers. But now he faces usurious debts from a hasty expansion of his business, and he will be killed unless he clears the debt in one month. The only way to save himself is to pretend to be the long-lost brother of an heiress and kill her to get her huge fortune. Min, the blind heiress, cold-hearted like Julian, slowly opens herself to him, and he, too, falls for her. But Julian has to pay his creditor and what makes it worse for him is that the illness that took Min’s eyesight relapsed, threatening her life.